It was a busy evening for the volunteers at the Portaferry RNLI Station on Wednesday 12 September. 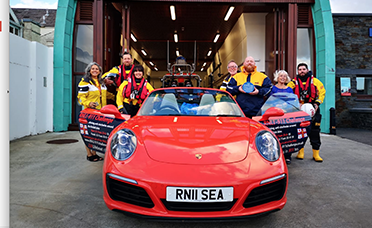 First of all, we had a visit from Belinda and James Richardson who are raising funds for the RNLI by attempting to drive anti-clockwise around the whole of the British Isles visiting all 238 RNLI Lifeboat Stations in a Porsche 911 within 911 hours! 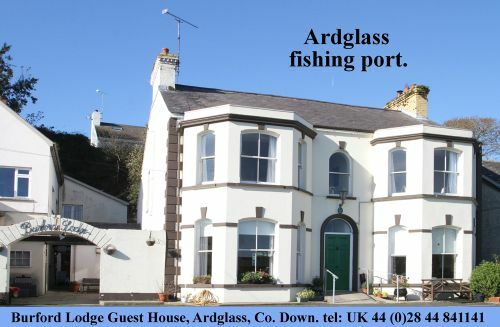 An RNLI spokesman said: “No sooner had James and Belinda headed off to continue their RNLI-911 Challenge, the Portavogie Youth 2011′ s Football squad arrived with some of their parents and coaches. 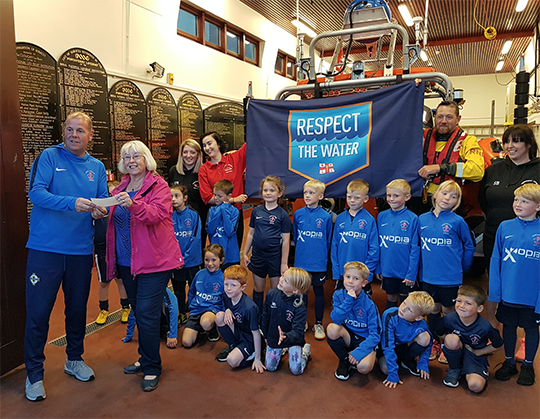 “They all enjoyed inspecting the Blue Peter V before their coach, David Cully, presented on their behalf a cheque for an astounding £1,300 to Mrs Pat Browne, chair of the Portaferry and District Lifeboat Guild. For more information on the RNLI, please visit – www.rnli.org.uk. The RNLI is independent of Coastguard and government and depends on voluntary donations and legacies to maintain its rescue service. Since the RNLI was founded in 1824, its lifeboat crews and lifeguards have saved over 137,000 lives. The RNLI is a charity registered in England, Scotland and the Republic of Ireland. Coach David Cully from Portavogie with the Youth Soccer Squad.